Particularly in the baby area, we like to create a homely atmosphere. We are sensitive to the needs of new parents as well as the child, as this could potentially be a difficult settling in period. We understand the importance of a new child starting at Nursery, and a Key Person will take responsibilty of creating a good bond with your child. This bond is essential to the development and social skills of a child. At Waingels we have 2 rooms on 1 level. 1 of our rooms can be made into 2 areas to enable us to be flexible with the age groups of the children. 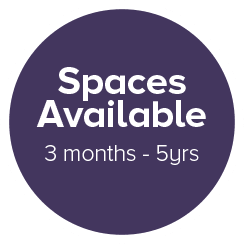 We have a designated area for Babies under 18 months, an area for children aged 18months to 2 ½ years and then a large room for our children aged 2 ½ to 5 years. We hope that it will make transitions very easy for the children here. When we feel children are ready to move to another area in the nursery we transition them. We take great thought and care over this and introduce short regular visits prior to the transfer to enable children to take their time to get to know the new area and also the new key person. The child is at the centre of everything we do, therefore all transitions are individual to the needs of each child and can go at pace which suits them. We sometimes make it possible for children to transfer in pairs. We envisage the Nursery as a whole, and continued contact between all staff and children. We also encourage siblings to have regular contact with each other. We hold a Transition Policy available to parents in our Policy and Procedures Folder. Before your child comes to Nursery, we will discuss your child’s sleeping arrangements with you. We can provide cots, sleeping mats and bedding for all children according to their needs. We cook and prepare fresh food on site for the children every day. We use local butchers and grocers to purchase meat, fresh vegetables and fruit. We do not use nuts in the Nursery, and can cater for allergies and dietary needs. We offer a choice of cereal, toast and fruit for breakfast until 9 am. We offer a midmorning snack of fresh fruit or vegetables, bread sticks or crackers and milk or water is offered at 10 am. At 12.00 we serve a cooked meal and dessert. At 3.30 pm we serve a hot or cold tea with fresh fruit or yoghurt. We encourage all the children to sit at the table and be respectful of others at meal times. We consider it important to teach everyone good table manners. We offer babies a diet that does not contain extra salt, sugar or unnecessary additives. Parents are kept informed of the meal plans and our nutrition policy is displayed on the wall, in the entrance hall.